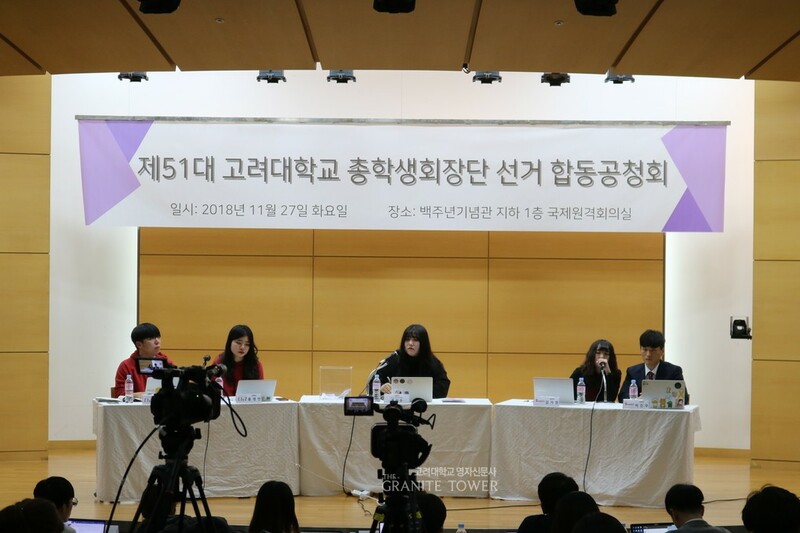 On November 27, a public hearing on the 51st Korea University Student Union (KUSU) candidates, SYNERGY and Da-gam, was held at the Centennial Memorial Samsung Hall. KU students and the school press had an opportunity to ask each candidate about their policies. The public hearing had two sessions with an intermission. Song Min-ju, the President of the Central Executive Committee, commenced the first session which started with each candidates’ speech about their respective opinions. Da-gam emphasized the importance of the connection among the KU Community and that KUSU should be in charge for fostering it. Meanwhile, SYNERGY stressed out that KUSU should be approaching to KU students, which could be done by augmenting the means of communication online or offline. Then, Song gave each of three school presses, including The Korea University Weekly, 20 minutes to inquire about the pledges. Both candidates were asked to clarify their main policies. To SYNERGY, the questions mainly centered on the policy that aim to ameliorate the education environments in the Science and Engineering Campus. Moreover, many asked about the promise to introduce a school bus for KU, which is rather an unprecedented. To Da-gam, the presses focused on the policies related to tuition fee reduction and revival of the drop system. The latter session focused on answering the questions gathered from the KU student participants. Notably, some inquired not only about the pledges, but also the candidates’ stance on certain matters. For instance, there was a question about the recent incident regarding Korea University Buddy Assistance (KUBA) stating Tibet as an independent country. The whole public hearing was a valuable time for understanding the stance of SYNERGY and Da-gam, and getting to know about their detailed explanation to implement their policies.